MEXICO CITY (CIMMYT) – The International Maize and Wheat Improvement Center (CIMMYT) has grown 150 tons of renewed, improved maize seed that will be sent to Haitian farmers to help jump-start the country’s seed sector, improve local food security and decrease malnutrition. This will be the largest seed shipment to any country in CIMMYT’s history. In 1998, CIMMYT, together with the Organization for the Rehabilitation of the Environment, introduced a new quality protein maize variety in Haiti. Named “Hugo” for CIMMYT maize breeder Hugo Córdova, the variety grew well under the island’s agro-ecological conditions and can decrease malnutrition and stunting among children that consume it. 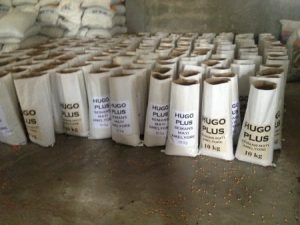 The product of decades of maize research in Haiti and Latin America, Hugo quickly became a favorite among farmers, but over time lost its genetic purity due to a lack of certified seed production and yields began to drop. Now, CIMMYT is working to help Haiti build their seed sector from the ground up, from developing improved seed to replace old varieties to providing capacity development at every level of the maize seed value chain, with incredible results.